Spirituality and religion can be defined in many different ways, and the distinction between the two concepts often is muddy. For the purposes of this analysis, spirituality refers to beliefs or feelings about supernatural phenomena, such as life after death, the existence of a soul apart from the human body, and the presence of spiritual energy in physical things such as mountains, trees or crystals. People may have these kinds of beliefs about supernatural phenomena or participate in spiritual practices even if they do not consider themselves to belong to (or actively practice) a religion. Indeed, some people may reject religion – with its strong connotations of structure, tradition and organization – while still embracing spiritual beliefs. In the United States, for example, nearly half of adults (48%) describe themselves as both religious and spiritual, but a substantial – and rising – share of the public (27% in 2017, up from 19% in 2012) call themselves spiritual but not religious. In Western Europe, by contrast, many people describe themselves as neither religious nor spiritual. Across the 15 countries surveyed, a median of 53% place themselves in this category. Far fewer Europeans consider themselves both religious and spiritual, spiritual but not religious, or religious but not spiritual. Finally, Europeans who consider themselves neither religious nor spiritual (median of 53%) – the largest group across the region – are much more likely than people in the other three categories to say they do not believe in any God or other higher power. They are also the least likely to say they have a soul (though a substantial minority do believe in a soul). They generally reject the statement that religion helps them choose between right and wrong, and agree that “There are NO spiritual forces in the universe.” Their views differ from country to country on whether religion does more harm than good. On the whole, Western Europeans have mixed views on religion and spirituality. When multiple questions about the impact of religion on individuals and society are combined into a scale, there is no consensus among people across the region on whether religion has a positive, negative or mixed influence. Public opinion in the Scandinavian countries of Sweden, Denmark and Norway is comparatively negative toward religion, while respondents in Portugal, Italy, Austria and Ireland hold much more positive views of religion’s value for individuals and society. 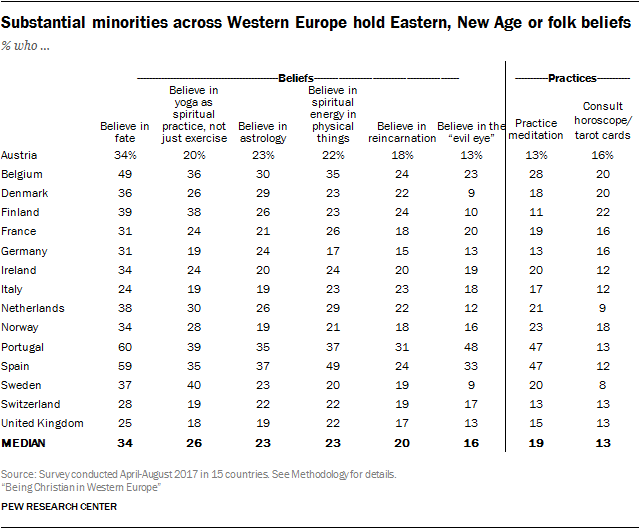 Similarly, when multiple questions about spiritual concepts are combined into a scale, the overall picture also is mixed, with about half of the public embracing spiritual beliefs in Austria, Italy and Ireland (some of the same countries where attitudes toward religion are most positive) and far fewer respondents affirming spiritual views in such countries as Sweden and Belgium. Europeans who identify as Christians tend to embrace spiritual beliefs and to view religion’s role in their lives and societies positively, while religiously unaffiliated Europeans tend to lean in the opposite direction. The survey also asked about a variety of beliefs and practices that are often associated with Eastern, New Age or folk religions. These include belief in yoga (as a spiritual practice, not just as exercise); belief in spiritual energy located in physical things such as mountains, trees or crystals; belief in the “evil eye” (that certain people can cast spells that cause harm); belief in fate, reincarnation and astrology; the practice of meditation; and the use of horoscopes, tarot cards or fortune tellers. In many Western European countries, a substantial minority of adults say they hold these beliefs or engage in these practices. For example, a median of 34% say they believe in fate (that is, the course of their lives is largely or wholly preordained). A median of 23% believe in astrology (that is, the position of the stars and planets can affect people’s lives). And a median of 20% believe in reincarnation (that is, that people will be reborn in this world again and again), while a median of 19% say they meditate. 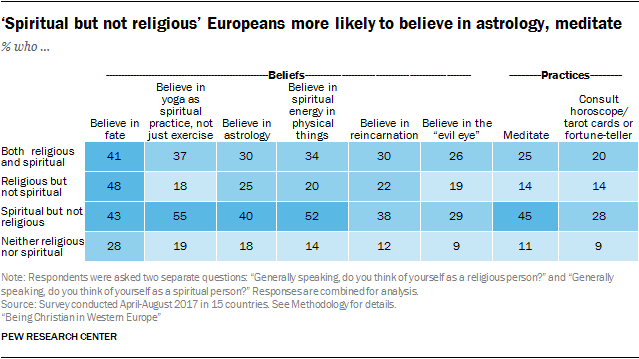 Such beliefs and practices are particularly common among Europeans who describe themselves as spiritual but not religious. The survey asked respondents two separate but related questions: Do you think of yourself as a religious person? And do you think of yourself as a spiritual person? In most countries, fewer than half of respondents say they are religious, and fewer than half say they are spiritual. Only in Portugal do solid majorities describe themselves as religious (72%) and spiritual (64%). Roughly half of adults in Italy (53%), Ireland (47%) and Spain (47%) say they think of themselves as religious. And, in Spain, a similar share of adults (52%) also say they are spiritual. Based on their responses to these two questions, Europeans can be sorted into four categories: 1) those who consider themselves both religious and spiritual; 2) those who consider themselves religious but not spiritual; 3) those who say they are spiritual but not religious; and 4) those who say they are neither religious nor spiritual. Of these four categories, “neither religious nor spiritual” is the largest in most Western European countries. A median of 53% across the 15 countries surveyed consider themselves neither religious nor spiritual, including clear majorities in Sweden (66%), Denmark (64%), Belgium (62%), Norway (62%) and the Netherlands (60%). On balance, “neither religious nor spiritual” is a smaller category in predominantly Catholic countries, such as Ireland (42%) and Italy (38%). People who say they are religious or spiritual (or both) generally believe in God or a higher power, while those who are neither religious nor spiritual tend to reject belief in God or a higher power altogether. The prevailing view among those who describe themselves as religious – either religious and spiritual, or religious but not spiritual – is that God exists “as described in the Bible” (medians of 51% and 56%, respectively). 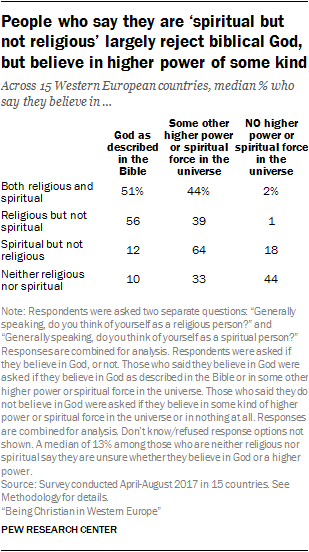 By contrast, a median of 64% of those who are spiritual but not religious say they believe in some other higher power or spiritual force, though not in the God of the Bible. 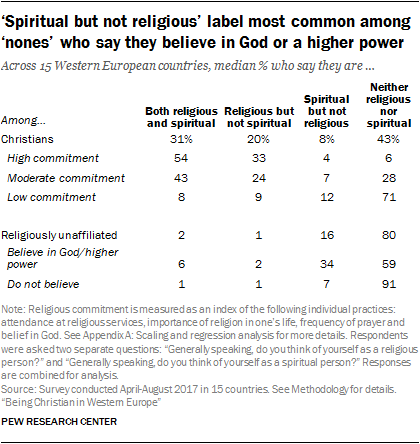 Europeans who are neither religious nor spiritual tend to reject belief in any higher power or spiritual force (median of 44%). Highly committed Christians generally say that they are either both religious and spiritual (median of 54%) or that they are religious but not spiritual (median of 33%). Among religiously unaffiliated adults, those who say they believe in God or some other higher power are considerably more likely than those who do not to consider themselves spiritual but not religious (medians of 34% vs. 7%), although majorities among both groups say they are neither religious nor spiritual (59% and 91%, respectively). On balance, women and those over the age of 34 are more likely than men and younger adults to say they are both religious and spiritual. And college-educated respondents are more likely than those with less education to identify as spiritual but not religious. In a region where the labels “spiritual” and “religious” are rejected by much of the population, the survey sought to dig deeper into feelings on these topics, asking respondents the extent to which they agree or disagree with a series of statements – four about spiritual concepts and four about the value of religion to individuals and society. Two statements about spirituality were framed affirmatively – “I have a soul as well as a physical body,” and “I feel a connection to something that cannot be seen or measured scientifically.” And two were framed negatively, giving respondents the opportunity to agree with statements rejecting spiritual concepts: “There are NO spiritual forces in the universe, only the laws of nature,” and, “When people die, that is the end; there is NO life after death.” A similar approach was used to probe feelings about religion (see below). Majorities in most countries agree with the idea that they have a soul, including seven-in-ten or more in Portugal (80%), Finland (73%) and Norway (70%). Sweden and the UK are exceptions; roughly four-in-ten Swedes (39%) and about half of British respondents (49%) say they believe they have a soul. Smaller, but still substantial shares across the region (median of 46%) feel a connection to something that cannot be seen or measured scientifically. At the same time, negative statements about spirituality also find some resonance in the region. A median of 48% – including most Belgians (61%) – say there are no spiritual forces in the universe, only the laws of nature. And a median of 40% say there is no afterlife. Respondents who describe themselves as either religious or spiritual (or as both) are more likely than those who identify as neither religious nor spiritual to embrace the spiritual ideas tested in the survey. In almost every country, majorities of those who say they are religious, spiritual or both say they have a soul. In Austria, for example, 89% of those who say they are both religious and spiritual believe in the soul. Among Austrians who say they are spiritual but not religious, 68% believe in the soul. And among those who say they are religious but not spiritual, 76% say they have a soul. Europeans who identify as neither religious nor spiritual tend to express skeptical or negative attitudes toward spirituality. For example, majorities in this group agree with the proposition that there are “no spiritual forces in the universe, only the laws of nature,” and many also say there is no life after death. Nevertheless, substantial shares of people who describe themselves as neither religious nor spiritual – including majorities of respondents in this category in Finland (60%), Portugal (60%), Denmark (58%), Norway (58%), Belgium (57%) and the Netherlands (57%) – say they believe they have a soul. These four questions can be combined into a scale to more comprehensively measure overall levels of spiritual beliefs in Western Europe.19 The results indicate varying sentiments toward spirituality in the region. Many people across the region embrace spiritual concepts such as the soul, an afterlife and connections that cannot be seen or measured scientifically; pluralities in 10 of the 15 countries surveyed lean in this direction, including roughly half of adults in Austria (52%), Italy (51%) and Ireland (49%). But substantial shares of adults across the region largely reject such beliefs or feelings about supernatural phenomena, including nearly half of Swedes (47%). And many others express mixed views – either embracing some spiritual concepts while rejecting others, or repeatedly saying they are unsure. Christians across the region tend to embrace the spiritual ideas tested in the survey. But those with high or moderate levels of religious commitment are much more likely than those with low levels of commitment to do so. Religiously unaffiliated adults, on the other hand, reject spiritual ideas. But the subset of religiously unaffiliated adults who believe in God or a higher power are considerably more likely to embrace other spiritual beliefs than are religiously unaffiliated people who do not believe in any higher power or spiritual force in the universe. Adults ages 35 and older are more likely than younger adults to embrace spiritual ideas. For example, about half (51%) of those ages 35 and older in Switzerland score at the high end of the four-question spirituality scale, compared with about a quarter (26%) of Swiss adults under 35. Belgium is one exception to this pattern, where older people are less likely than younger adults to embrace spiritual concepts. On balance, women are more likely than men to embrace spiritual ideas. In Sweden, for example, 35% of women score at the high end of the spirituality scale, compared with 22% of men. Using a similar approach to measure overall attitudes toward religion, the survey finds no clear consensus across Western Europe about the personal and social value of religion. In eight countries, attitudes toward religion are, on balance, more positive than negative. But attitudes toward religion lean negative in four countries and are divided in three countries. In most countries, fewer than half of people surveyed (median of 44%) say that religion helps them choose right over wrong. And similar shares in most countries (median of 39%) say religion gives meaning to their lives. On balance, even smaller percentages agree with the negative statements about religion – that it causes more harm than good (median of 33%) and that science makes it unnecessary (median of 32%). Only in Portugal and Italy do more than half of adults say religion helps them discern right from wrong and provides meaning and purpose. Meanwhile, at the other end of the spectrum, roughly half of adults in Sweden (50%), Norway (48%) and Denmark (47%) agree that religion causes more harm than good. Respondents who say they are religious (either religious but not spiritual, or both religious and spiritual) generally express positive attitudes toward religion. They overwhelmingly agree that religion gives them meaning, purpose and moral guidance, and they are considerably less likely to agree with the survey’s negative statements about religion. Those who say they are neither religious nor spiritual, meanwhile, are more likely to agree with negative rather than positive statements about religion. Indeed, relatively few say religion has value for them personally. But, still, negative views about religion are not dominant: In no country do a majority of adults in this category say religion causes more harm than good, overall (median of 43%). People who say they are spiritual but not religious present a mixed picture. They tend to disagree that religion causes more harm than good, or that science makes religion unnecessary. But at the same time, they also disagree that religion gives their life meaning or helps them choose between right and wrong. In about half the countries surveyed, people are more likely to hold positive views of religion than negative ones. A majority of adults in Portugal (59%), for example, express mainly positive views on the religion scale, compared with 17% who voice largely negative views. Views about religion are also more positive than negative in Italy, Austria and Ireland, to name a few examples. On the other hand, in several countries – especially Sweden and Denmark – people tend to express negative attitudes toward religion. Roughly half of adults in Sweden (50%) and Denmark (47%) have highly negative scores on the religion scale, while far fewer in both countries express highly positive views of religion. Generally, Christians across the region tend to hold positive views of religion’s impact on their lives or in society overall. But even among Christians, roughly a third of people in Sweden (35%) and Denmark (35%) hold more negative than positive attitudes on the scale. This at least partly reflects differences by level of observance: Majorities of highly committed and moderately committed Christians express positive attitudes about religion, but those with low levels of commitment tend to voice mixed or negative views. 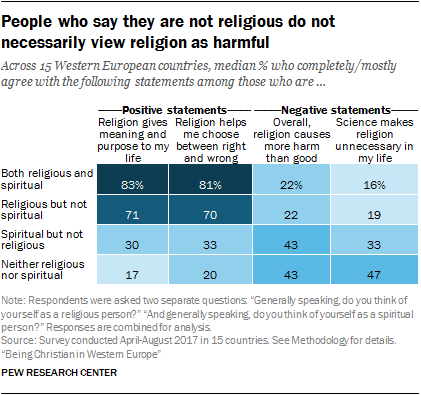 Religiously unaffiliated Europeans generally hold negative views of religion, but among this group, those who believe in God or a higher power are more likely than those who do not to have positive attitudes toward religion (medians of 15% vs. 2%). Even among religiously unaffiliated believers, roughly half or more in nearly every country score on the negative end of the scale. Across many countries, women, older adults and those with less than a college education are more likely than men, adults under 35 and college graduates to have positive views of religion. In Spain, for example, college graduates tend to have negative attitudes toward religion (41% mostly negative vs. 28% mostly positive), while people with less education tend to lean toward positive attitudes (29% negative vs. 41% positive). The survey also explored the extent to which Western Europeans hold beliefs and engage in practices often associated with Eastern, New Age or folk religions. These include whether they believe in fate, astrology, spiritual energy, yoga as a spiritual practice, reincarnation, and the evil eye, as well as whether they meditate or consult horoscopes, tarot cards or fortune tellers. Most people surveyed say they do not hold these beliefs or follow these practices. But there is considerable variation across the region: People on the Iberian Peninsula have relatively high levels of engagement with some of these beliefs, while the beliefs are much less common in Scandinavia. For example, roughly half of adults in Portugal (48%) and a third in Spain (33%) believe in the “evil eye” (the idea that certain people can cast curses or spells that cause bad things to happen to someone), compared with 9% each in Denmark and Sweden. Of the eight items tested, belief in fate – the idea that the course of your life is largely or wholly preordained – is most common across the region. Majorities of adults in Portugal (60%) and Spain (59%) say they believe in fate, as well as roughly half in Belgium (49%) and a median of about one-third (34%) across the 15 countries surveyed. A smaller, but still substantial, share of Western Europeans believe in yoga as a spiritual practice (regional median of 26%). This belief is especially prevalent in Sweden (40%), Portugal (39%) and Finland (38%). A median of 20% across the region say they believe in reincarnation – that people will be reborn in this world again and again. But relatively few adults across the countries surveyed say they consult the horoscope, tarot cards or see a fortune teller (median of 13%). Previous Pew Research Center surveys have asked about some of these same beliefs and practices in other parts of the world. Generally speaking, they are less common in Western Europe than elsewhere. For example, a median of 16% of respondents in Western European countries say they believe in the evil eye, compared with a median of 48% in Central and Eastern Europe as well as medians of 46% in Latin America and 39% in sub-Saharan Africa. Adults who say that they are spiritual but not religious are more likely than others in Western Europe to say they engage in these beliefs and practices. By contrast, respondents who describe themselves as neither religious nor spiritual are least likely to engage in most of these beliefs and practices. Throughout Western Europe, very few respondents display high levels of these alternative beliefs and practices. Majorities in nearly every country say they observe two or fewer of the eight items tested, including roughly three-quarters in the United Kingdom (77%), Germany (75%) and Switzerland (75%). In fact, substantial shares of respondents in several countries say that they do not engage in any of these beliefs and practices: In Italy (40%) and Austria (35%), for example, more than a third of adults say they do not engage in any of the Eastern, New Age or folk beliefs and practices mentioned in the survey. Consistent with their overall low levels of religious belief and practice, European men show lower levels of engagement with these alternative beliefs and practices than do women. For example, just over half of men (54%) in Spain score low on the scale, compared with 37% of Spanish women. And the shares of men in Denmark (39%) and Norway (40%) who do not observe any of these beliefs and practices are larger than the comparable shares of women (25% and 23%, respectively). The picture is more mixed when it comes to differences by education. In several countries, adults with less than a college degree are more likely than college-educated adults to believe in fate, astrology or the evil eye, and more likely to say they consult horoscopes or tarot cards. But the reverse is true for meditation and yoga: College-educated respondents are more likely than their less-well-educated peers to say they meditate or believe in yoga as a spiritual practice. Age patterns also vary. For example, in Belgium, young adults (under 35) are more engaged with alternative beliefs and practices than their elders, while in Switzerland and the UK, younger people score lower on the same scale. In most places, Christians score low on the scale of alternative beliefs and practices, and there are no consistent differences among Christians depending on their levels of religious commitment. Religiously unaffiliated Europeans show even lower levels of engagement with Eastern, New Age or folk beliefs and practices than do Christians. But the subset of “nones” who believe in God or a higher power are more likely than unaffiliated people who do not believe in any higher power – and more likely than Christians – to engage in alternative beliefs and practices.